Services for Dennis “Denny” Davies, 63, of Groton will be 2:00 p.m., Saturday, January 26th at the United Methodist Church, Groton. Pastor Brandon Dunham will officiate. Burial will take place at a later date in Wilmot. 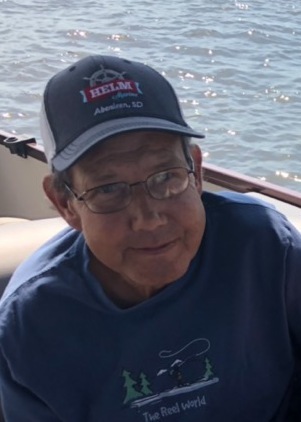 Visitation will be held at the chapel on Friday from 5-7 p.m.
Denny passed away January 22, 2019 at his home. Dennis Wayne was born on November 30, 1955 in Minneapolis, MN to Evan and Maxine (Caldwell) Davies. His early years were spent in Minneapolis. They later moved to Waubay where Denny attended school. He graduated from Sisseton High School and enlisted in the US Navy in November of 1973. Following his honorable discharge in 1977, he returned to South Dakota. On September 29, 1979 he was united in marriage with Teresa McFarlane in Wilmot. That same year, Denny enlisted in the Army National Guard and served for the next 18 years. In 1980, they moved to Groton where Denny was employed at Darrel’s Sinclair. Years later he began a 23 year career at the Groton Area School District as a custodian. Dennis loved spending time with his family, especially his grandchildren. He enjoyed the outdoors and could often be found fishing or hunting. He was an avid Notre Dame football fan, along with a Garth Brooks fan. His dog, Bo also held a very special place in his heart. Celebrating his life is his wife, Teresa, children, Jessica (Allen) Ekern of Watertown, Traci (Dale) Kramer of Groton, Andrew (Amanda) Davies of Sioux Falls, grandchildren; Abby and Evan Ekern, Emma Davies, Gabbie, Ava and Skyler Kramer, his siblings, Gary Davies of Fayetteville, NC, Darrell Davies (Sharon Wattier) of Webster, Linda (Virgil) Lewandowski of Waubay, Tammy Red Wing of Choctaw, OK, Grace (Jim) Brian of Meriden, KS. Preceding him in death were his parents, one brother, Evan and a brother-in-law, Tim. Honorary Casketbearers will be Staff at Groton Area High School, Merle Harder, Tom Pigors, Butch Farmen, Groton Transit Employees, Avera St. Lukes Dialysis Team and Former Employees of Darrel’s Sinclair. Casketbearers will be Mike Davies, J.R. Lewandowski, Jim Gerdes, Alan McFarlane, Dana McFarlane and Mike Nehls.